LET'S FACE THE MUSIC AND DANCE: Five-time Tony Award winner Susan Stroman. who has previously choreographed to the melodies of Rodgers, Kern, Kander and Gerhwin (not to mention Mel Brooks). is developing a new ballet set to the songs of Irving Berlin...DOUBLE FEATURE. which will pair the Berlin ballet with another dance piece using the music of his Broadway and Hollywood contemporary Walter Donaldson, will premiere at the New York City Ballet on January 23. 2004...Most of next years repertory at NYCB is themed to the centennial of founding father Mr. B a.ka. George Balanchine and includes a return of Slaughter on Tenth Avenue, the ground-breaking ballet he created for Rodgers & Harts 1936 musical ON YOUR TOES...For further information: www.nycballet.com. R&H ON DVD: Unlike the laser disc or the eight- track, the DVD is here to stay and we're proud that most of the R&H titles are now represented in this versatile. durable format..Fox Home Entertainment issued its first new and improved R&H DVD s in the late 20th century culminating in a lavish 2-disc SOUND OF MUSIC (released in the fall of 2000, and subsequently reissued in a one-disc edition). while bundling that title with OKLAHOMA!, CAROUSEL, STATE FAIR (1945), SOUTH PACIFIC and THE KING AND I in a deluxe boxed collection...Telling the story behind those R&H movie musicals is the popular clips documentary THE SOUND OF MOVIES, which FoxStar recently reissued in a newly- upgraded DVD...so versions of CINDERELLA thrive on DVD the 1965 Lesley Ann Warren version appears on Columbia/Tri-Star Home Entertainment, and the 1997 Wonderful World of Disney spectacle. starring Brandy and Whitney Houston, is on Disney Home Entertainment. where it is joined by the 2001 ABC-TV version of SOUTH PACIFIC starring Glenn Close... Previously seen on PBS, the acclaimed AMERICAN MASTERS 2001 documentary RICHARD RODGERS: THE SWEETEST SOUNDS. can be found on DVD from Wellspring, and RICHARD RODGERS: SOME ENCHANTED EVENING (filmed at Londons Theatre Royal, Drury Lane, during the Rodgers Centennial) will soon be released by Image Entertainment...Two more DVD's from Image should generate plenty of excitement for eager fans in November, Image will release the American-formatted DVD of the acclaimed Royal National Theatre of Great Britains 1998 production of OKLAHOMA! starring Hugh Jackinan...And next year, Image is slated to issue the very first home entertainment edition of the legendary 1957 live television performance of Rodgers & Hammersteins CINDERELLA starring Julie Andrews. proving to long-suffering doubters that impossible things are happening every day...Those keeping score will note that the only R&H movie musical not on DVD these days is FLOWER DRUM SONG but please. direct your pleas to Universal Home Entertainment, not us: wore as eager as you to see this 1961 charmer hit the DVD circuit! OKLAHOMA! 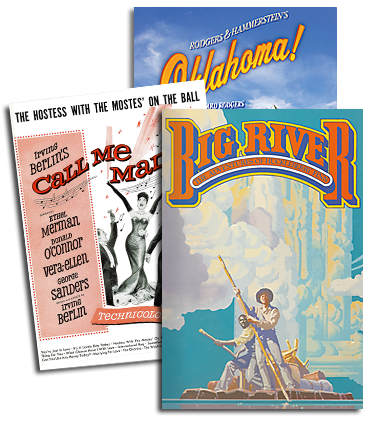 OK: The aforementioned Image DVD of OKLAHOMA!. starring Hugh Jackman as Curly, Josefina Gabrielle as Laurey, Maureen Lipman as Aunt Eller, and Olivier and Tony Award winner Shuler Hensley as Jud Fry is a filmed version of the Royal National Theatre production directed by Trevor Nunn and choreographed by Susan Stroman...First broadcast on Sky-TV in Britain in late 1999, the films long-awaited American DVD release will be followed by a special broadcast on Great Performances (PBS) on Saturday night, November 22 (check local listings). THANK GOD IT'S FRIDAY: Mary Rodger's effervescent 1972 novel, FREAKY FRIDAY (Harper Collins),. has never been out of print, but this summer it leapt back onto the .New York Times Childrens Bestseller list, sparked by the hugely-popular and ecstatically-received Walt Disney Pictures latest film version starring Jamie Lee Curtis and Lindsay Lohan...Hailed by Entertainment Weekly as a funny shrewd,. no-bull family comedy and by the New York Times as a quick-witted, perfectly modulated family farce... [from] Mary Rodgers much-loved novel, FREAKY FRIDAY broke box office records, earned kudos for its switcheroo-stars, and became, in the words of Newsweek Magazine, the surprise hit of the summer""...In addition to the novel (hailed by Newsday as a contemporary classic),. FREAKY FRIDAY has also been the basis for a 1977 Disney film, a 1995 ABC-TV movie, and a 1991 musical, written by Rodgers and John Forster for Theatreworks/USA. THE SINGING DETECTIVE: New Williamson Music lyricist David Zippel has already, in his stellar career, worked with such composing greats as Cy Coleman. Alan Menken and Matthew Wilder...Now add to the list Andrew Lloyd Webber the duo is currently completing work on a new musical, ThE WOMAN IN WHITE. based on Thomas Wilkie Collins 1860 spine-tingler (considered Britains first detective novel)...With a libretto by Charlotte Jones (HUMBLE BOY) and directed by Trevor Nunn, THE WOMAN IN WHITE will be haunting Londons West End sometime next year. Meantime, patrons of last summers annual arts festival at Lloyd Webbers English estate, Sydmonton, were treated to a glimpse of Act I where, according to Variety, the musical enjoyed a distinctly buzzing airing...with special praise afforded David Zippels lyrics. THREEPENNY MILESTONE: August31 marked the 75th anniversary for Kurt Weill and Bertolt Brechts brilliant and savage musical. DIE DREIGROSCHENOPER (THE THREEPENNY OPERA)...The R&H Theatre Libra licenses the landmark 1952 Marc Blitzstein version of this daring work, which retains its power and impact to this day...The Jean Cocteau Repertory Theatre in Manhattan this fall. and the Williamstown Theatre Festival in Massachusetts last summer, were just a few of the prominent theatres to take on this exciting yet provocative work in its anniversary year THE THREEPENNY OPERA, wrote Tom Briggs in these pages five years ago. has remained a cultural juggernaut for seven decades, challenging social values while continually thrilling audiences the world over...In other words, Mack the Knife may be 75, but he is still cutting edge. RODGERS HIP-HOP: In early summer, the music of Richard Rodgers was given a distinctively modern sound on the London stage and atop the U.K. charts...As mentioned in our previous issue, the Theatre Royal. Stratford East. broke house records with DA BOYZ, a hip- hop and rap-spun take on THE BOYS FROM SYRACUSE (set in the urban enclave of F.S.S. a clever deconstruction of the originals setting of Ephesus)...This crowd-pleaser was hailed by the New York Times as a thumping jive British version that brings the musical tradition of Richard Rodgers and Lorenz Hart bracingly into the 21st century....While DA BOYZ was doing its thing in East London, the British urban rap group, Big Brovaz, was climbing the charts with Favourite Things,"" its version of the whiskers-on-kittens standard, complete with re-mix, dance track and video variations... Favourite Things rode the top of the charts in the U.K., continental Europe, New Zealand and Australia for most of the summer. TRIPLE CROWN: In our Winter 2003 edition we reported on a fascinating theatrical triptych the Yale Reps staging of MEDEA/MACBETH/CINDERELLA, in which classic works by Euripides, Shakespeare and R&H were performed on the same stage at the same time...ln June, M/M/C was awarded the Connecticut Critic's Circle Award for Best Play, and its co-directors Bill Rauch and Tracy Young were hailed as Best Directors... Congratulations. and three cheers! STOUTHEARTED MEN: Their first shot at musical comedy stardom was a show called I LOVE YOU, YOURE PERFECT, NOW CHANGE which opened Off-Broadway in August of 1996 and, more than seven years later, is still going strung, joined by hundreds of regional productions nationwide and across the globe. its themes as topical as ever, its unique title now part of the lexicon...For their first musical together since, Williamson composer Jimmy Roberts and lyricist/librettist Joe DiPietro have fashioned another intimate, contemporary Off-Broadway musical about checkmating in the game of love THE THING ABOUT MEN...Based on the popular 1985 West German film MANNER, THE THING ABOUT MEN opened at New Yorks Promenade Theatre in August, where it was hailed by the Wall Street Journal as smart and funny, and dubbed an uproarious musical by The New Yorker ..DiPietro continues to develop numerous other projects as well, including his adaptation of Rodgers & Hammersteins ALLEGRO, scheduled to premiere at the Signature Theatre in Virginia early next year...The late James Hammerstein had urged him to do the ALLEGRO re-write. so I really want to do a good job on this one, DiPietro told the Newark Star-Ledger recently, to honor both his and his fathers memory. THE WORDS I'LL LOVE YOU TILL THE DAY I DIE: No, were not starting a weddings column here in Happy Talk, but we could not resist a proprietary smile and heartfelt congratulations to newlyweds Jessica Stone and Christopher Fitzgerald, who were married in August...The duo, Broadway performers both, met on the first day of rehearsal for BABES IN ARMS at City Centers Encores! in 1999, where they were paired for what turned out to be a knock-about, show-stopping rendition of I Wish I Were In Love Again (which they reprised later that year at the Lorenz Hart U.S. postage stamp dedication ceremony)..As the bride reported to the New York Times recently, fiction became fact for these two by the time BABES IN ARMS finished its concert run on Valentines Day99...At the end of the big number our kisses definitely became more than just stage kisses. she recalled. not that anybody in the audience would know!